The Forest demonstrates on Blu-ray that it’s probably not a place many viewers will wish to visit. Plot: A woman goes into Japan's Suicide Forest to find her twin sister, and confronts supernatural terror. The Forest is an example of a potentially good scary idea being totally undone by hapless storytelling. The movie follows Sarah (Natalie Dormer) as she travels into the Aokigahara Forest in Japan in search of her missing twin sister, Jess. The real forest is known as a “Suicide Forest” where people travel to kill themselves, and is a densely grown area where it’s extremely easy to become hopelessly lost. (Not to mention cold, since there are underground ice caverns throughout…) What little plot substance there is in this movie is the idea that Jess is likely already dead, and that Sarah’s hunt for her is plagued by family sadness that goes back to the death of their parents. So against advice, Sarah willingly goes into the dark, scary forest, accompanied by a helpful (maybe overly helpful) American writer, Aiden (Taylor Kinney). MORE SPOILERS: What seems to have happened here is a kind of committee creation, where Zada decided he wanted to make a scary movie about the Aokigahara Forest but failed to come up with anything particularly interesting or scary. To be fair, the notion of doing a movie about this Forest is actually quite promising – there could be some very interesting and beautiful imagery a solid director could evoke. Unfortunately, Zada is not that director, and this isn’t that movie. The script simply doesn’t have any meat on its bones, and without either a solid script or director, Natalie Dormer and Taylor Kinney are left to their own devices. What viewers get here is a movie that’s actually difficult to sit through even at only 94 minutes. The Forest is being released to home theater viewers this week, after having had its theatrical run in early January. (Come to think of it, that really should have been the warning sign, shouldn’t it?) The packaging here includes just the Blu-ray, which holds the movie in high definition, along with a few scattered special features. Instructions for downloading a digital copy of each movie are included on an insert in the packaging. The Forest is presented in a 1.85:1 1080p AVC transfer (avg 34 mbps) that shows off the mostly Serbian locations fairly well. The brief shoot that this company did in Japan is probably the best-looking section of the movie (and appears to be where much of the movie’s budget went), providing some lovely traveling shots of Natalie Dormer riding in a taxi. The forest location in Serbia also comes across fairly well, particularly in the daylight sections. The darker scenes at night and in the ice cavern are intentionally murky. The Blu-ray of The Forest comes with a few bonus features: a commentary with Jason Zada, a brief making-of featurette and a few galleries of photos and concept art. Feature Commentary with Director Jason Zada – Jason Zada provides a scene-specific commentary, talking through the movie about the nuts and bolts of how the movie was shot. He’s clearly proud of his work here, but also completely unaware why the movie isn’t working – or even the very fact that it isn’t working. Exploring The Forest (8:05, 1080p) – This brief featurette includes all the usual elements – film clips, some video from the set and a few soundbites from the EPK interviews of various people, including Jason Zada and Natalie Dormer. BTS Photos – A few on-set photos are included here, showing Zada working with the cast. Set Illustrations – Here are a few examples of the design work done by the movie’s art department in Serbia. Visual Effects/Makeup Concept Art – This is mostly a series of proof sheets of the various options for makeup designs for the ghosts seen at times during the movie. Model Cave Photos – This is imagery of the ice cave model used for planning of the underground sequence. (Zada amazingly says at one point in the other materials that he was thinking of shooting in a real underground cave before smarter heads advised him to shoot that material on a stage (read: converted warehouse) under more normal conditions. Storyboards – And here a few of the storyboards created for the movie. 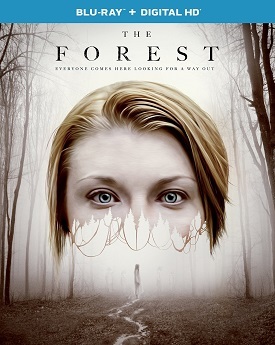 The Forest probably could have been an interesting and scary movie, had it been given a stronger script or director. As it is, the movie has a few nice images here and there, but not enough story or substance to justify even a 94-minute running time. The Blu-ray presents the movie with a solid high definition picture and all the usual cattle prods in the sound mix.